Extremely late on this one and there are no excuses for it. Better late than never right? We hope you can forgive us and get right to the tunes. We apologize in advance if some of the listings are short (most will be), we really wanted to get this out to you all. Per usual, we’re sorry if we missed you, but help us find you! Remember that if you have any new content for April to submit shoot a message to our contact page or send an email to us. Not much time left, we’re almost halfway into the month. March brings us the newest from Providence’s araabMUZIK. Though he doesn’t live in Rhode Island anymore, it’s never a bad time to support. Check out the six-track album below. March brings a new track from щ∆╫≥. Check out “Loophole” below. Ceez and Pyrex Lex link up and drop their collaborative project Iceberg. The album was executively produced by ClarkWork with additional production from Danny Keyz. New this month we have the official video for Dee Gomes’ “Change Up.” The track is definitely in my top three of songs from True Colors. The Hyde Park artist drops his latest album, The Show. J Duce brings to life his “Dopeman” track with CBNOne-directed visuals. Jae Reason, who we previously featured on Local Crafts, just dropped his 10-track Midnight Machine. The release consists of seven songs and three bonus tracks. Jefe REPLAY brings his track “FWM” to life with the M9 Visuals-directed video. Follow Jefe around the U.S. as he teleports from location to location, Henny and phone in hand, using his handheld button to do it. We get new visuals for King OSF’s “Cus I’m Home” and “Down To Ride”. Coming off of the release of his 2 Sides EP with Jiles, Luke Bar$ drops Daymian Mejia-directed visuals for “OK OK”. Rosé Petal dropped her newest, self-produced track “Out of Blue” this month. The track serves as her newest song since she released the video to “Why” back in October. Fun fact, this is the first time we feature a pop song on Local Crafts. In March, Jon Hope brought his series to the Queens Library. He, along with Brian “B Dot” Miller, of the Rap Radar, discussed Meek Mill’s Championships using a couple of different themes. The conversation was moderated by Ralph McDaniels. 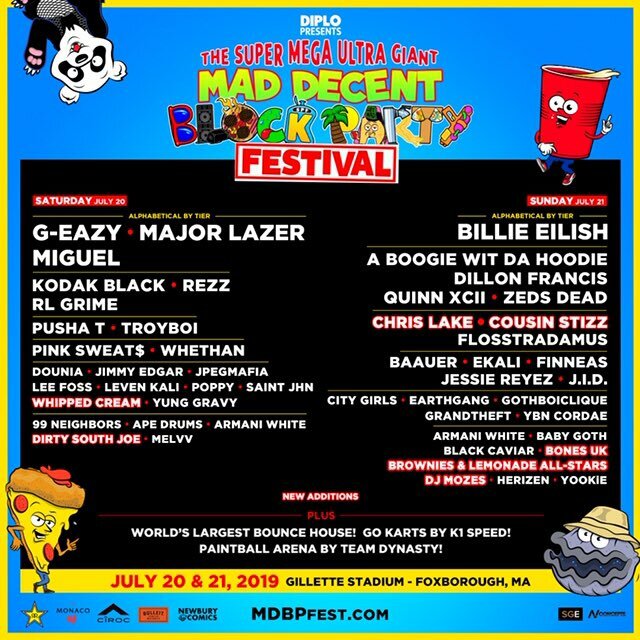 Diplo and his label Mad Decent announced their two-day “The Super Mega Ultra Giant Mad Decent Block Party Festival”. The festival takes place July 20 and July 21 at Gillette Stadium in Foxborough, Massachusetts. The festival features Dorchester’s Cousin Stizz. That’s it for March 2019. Also, we’re looking for writers, just shoot an email to us. Any genre let’s do it. Rest in Peace Nipsey Hussle. The Marathon Continues.